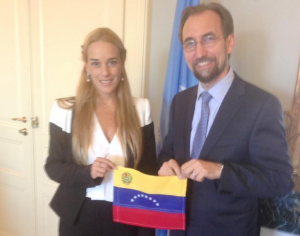 UN High Commissioner for Human Rights and Lilian Tintori, wife of opposition leader Leopoldo López who is currently serving a 13 year sentence (in house arrest) for his responsibility in the deadly violence of the 2014 guarimbas. The mainstream media have a crucial role to play in the war against Venezuela, creating a distorted narrative and a constant frenzy that are crucial for any regime-change operation. With violent protests having failed to topple the government and to stop the Constituent Assembly, the plan switched to military threats and economic sanctions. But these come directly from an unpopular US administration, and a more impartial-looking figure was needed. The High Commissioner for Human Rights, Jordanian Prince Zeid bin Ra’ad al Hussein, stepped up to the plate with the backing of more than 100 NGOs. We tackle the manipulation of human rights for imperial purposes, but first we examine how the term “NGO” is woefully inadequate to describe these organisations. On occasion of the 36th Session of the UN Human Rights Council, 116 “NGOs”1 signed a letter demanding that Venezuela be a priority for the Office of the High Commissioner for Human Rights (OHCHR). The effort was spearheaded by none other than Human Rights Watch (HRW). HRW has a long and documented history of bias and outright lies in their reports on Venezuela, which is no surprise given their blatant revolving door with the US government. Among the signatories are several usual suspects such as Provea or Foro Penal, whose president Alfredo Romero was a recent speaker in a “US Democracy Support” forum. Another organisation on the list is Transparencia Venezuela, which includes as sources of funding the EU, several embassies and the parent organisation Transparency International. And although Transparency International is much shadier than it sounds, at least we can laud their transparency in listing their backers. The list includes the US State Department, the National Endowment for Democracy (NED), George Soros’ Open Society, even corporations such as Shell. One more that stands out, and is quoted regularly by the media, is the International Commission of Jurists, which sounds very noble and independent until you discover that they were initially funded by the CIA. The issue here is with the term “non-governmental organisation”, which are always presented by the media as faultless, impartial actors. While there are many scenarios in which independent organisations can step in and provide invaluable services, this is hardly the case of groups funded by the NED (or USAID, or similar agencies) to “promote democracy” or “defend human rights” in countries like Venezuela. These are merely extensions of the US and western foreign policy apparatus, working as the local infrastructure that is necessary in regime change operations as well as a source for the media to build its biased narrative. At the end of the day, it is the term “non-governmental organisation” that falls very short of describing the nature and activities of these groups. If an organisation in Venezuela, or anywhere else, is funded by the US government, in what world is it a “non-governmental organisation”? One cannot prove that all the “NGOs” standing with HRW are western-funded, but advancing western interests is very much advancing corporate interests, and it is doubtful that anyone would do that for free. 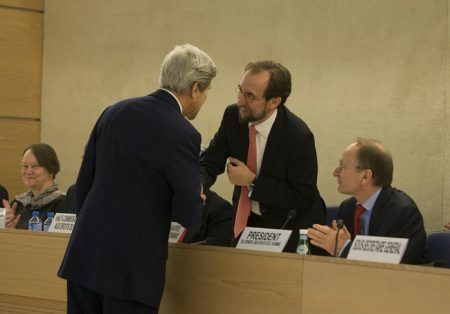 While one should not judge a book by the cover, it might be useful to consider the background of the UN High Commissioner for Human Rights, Prince Zeid bin Ra’ad al Hussein. A member of the royal family of Jordan, he comes from a Hashemite dynasty whose calling card has been its pliancy to imperial interests in the Middle East. And having served as ambassador to the US and permanent representative to the UN, he is, much like Jordan, someone the US can rely upon. His most recent statement, which could just as well have been written by the US State Department, was delivered during the 36th Session of the Human Rights Council. It takes aim at every inconvenient country, from Iran to North Korea, while important US allies like Bahrain or Egypt are invited to “engage more productively” with his office. Israel is treated with kid gloves, and somehow the blame for the humanitarian crisis in Gaza is supposed to be shared between Israeli and Palestinian authorities. And there is no mention whatsoever of Saudi Arabia, where surely there are no human rights issues… Even when addressing the catastrophe in Yemen there is only a passing mention to “coalition airstrikes”. And then the High Commissioner gets to Venezuela, sounding like any opposition leader or US official on “human rights violations” during anti-government protests or the “crushing [of] democratic institutions”, and suggesting an investigation into possible “crimes against humanity”. Never mind Colombia, where for years the army killed thousands of civilians and dressed them as rebels to collect rewards. Never mind Saudi Arabia, conducting double tap strikes2 against funerals in Yemen, or the US “torturing some folks,” or Israeli soldiers killing children because they were “running like terrorists“. The High Commissioner is worried that crimes against humanity have been committed in Venezuela! This statement comes on the heels of a OHCHR report about Venezuela that Joe Emersberger described as “embarrassingly shoddy and biased“. It barely mentions any violence coming from the opposition ranks, and while offering a tally of deaths allegedly caused by government forces and the bogeyman colectivos, there is no detailed breakdown to be compared with other accounts such as the one by Venezuelanalysis. Remarkably, given the importance of the issue and the damning verdict that the OHCHR wishes to pass, no investigators from the UN body set foot in Venezuela. Instead the report relies on carefully selected testimonies and the “NGOs” we just discussed. 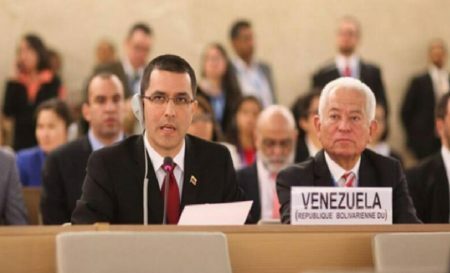 Venezuelan Foreign Minister Jorge Arreaza condemned the manipulation of human rights to attack Venezuela and the lies in the recent OHCHR report. The report is selective and biased, and represents a further example of the unfortunate politicisation that affects the work of the OHCHR, undermining its credibility and standing. Use of firearms, explosives, setting up barricades, people burned alive, attacks against hospitals, […], is this the model of “peaceful protests” that this council wants to promote? This is a good time to stress that legal systems are not moral or just by definition, but a reflection of who holds power, and this is especially true of international law. Though the struggle for an arena where all countries have the same weight is imperative, we are fooling ourselves if we are counting on international bodies to be impartial upholders of justice (just look at Palestine). Recent international tribunals have only served to reinforce the US/western narrative, either as a posteriori justification for past wars such as the one in Yugoslavia, or to justify upcoming ones against troublesome leaders like Gaddafi. We should clarify that our argument is not some kind of moral relativism, whereby we defend that the alleged crime A should not be investigated until justice is served for (the much worse) crime B. We are not arguing that nobody can be guilty of crimes against humanity until Henry Kissinger is tried, although it is hard to take any international tribunal seriously if the most blatant crimes are immune from prosecution. But what is definitely absurd and unacceptable is to have the US empire, either directly or through its proxies, be the judge trying other people and countries. This article was posted on Thursday, September 21st, 2017 at 8:04pm and is filed under Fake News, Human Rights, Media, NGOs, United States, US Hypocrisy, Venezuela.